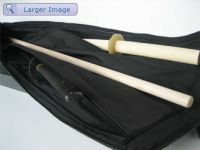 Carrying Case Whether it's to store your katana at home or you do need to take it with you to your dojo, a sword bag is a must have ! All swords, whether we are talking about katana in shirasaya or koshirae (formal mountings), they do need to be kept in their sword bags (fuduka). The kojiri (head of the scabbard) need to go into the swordbag first to avoid the possibility of an accidental fall of the blade into the bag while you are holding the saya.